For some strange reason, Victor Hugo visited Lysefjord in 1866 and wrote that Lysefjord must be the most terrifying of the ocean reefs. 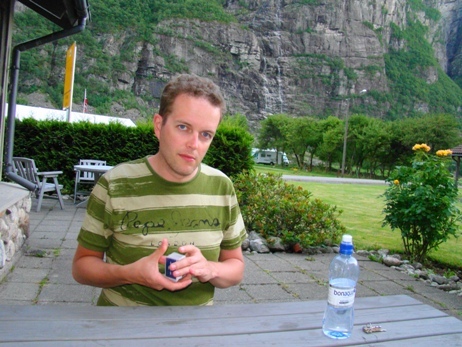 Maybe he wanted to dramatize his travel experiences just like travelers of today? 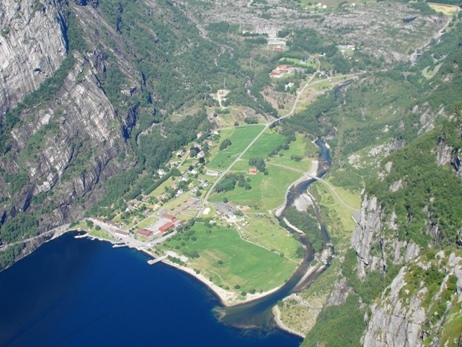 In the end of the fjord lies Lysebotn, a little village with a permanent population of 15 and maybe a hundred over-night tourists. 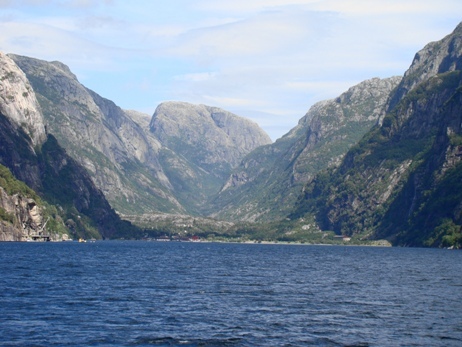 The village is surrounded by mountains and the fjord in every direction. 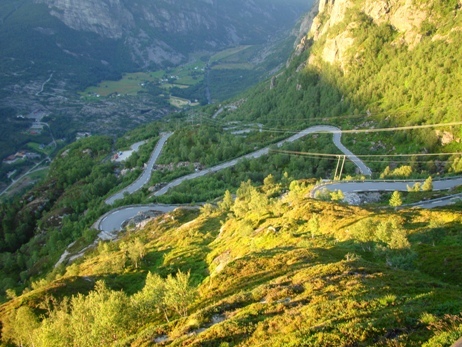 A small road with 27 serpentines and a 1.1 kilometers long tunnel leads up to Kjerag and continues towards Sirdal. The road has an average inclination of 10 percent, and we saw many brave cyclists going up the hill. 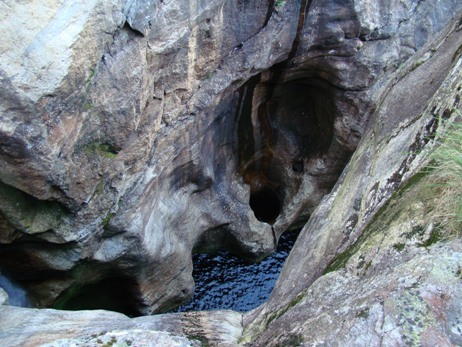 Lysebotn is famous among BASE-jumpers, Kjerag is one of the most known jump locations in the world. 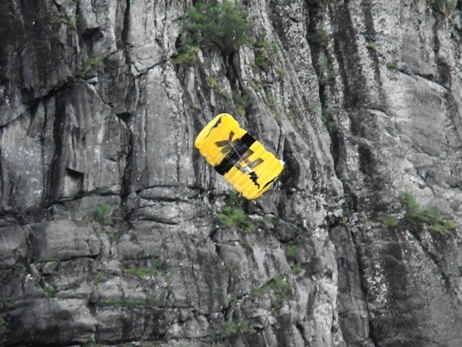 It is really dangerous too, since 1986 it has taken the lives of nine jumpers, many of them experienced. 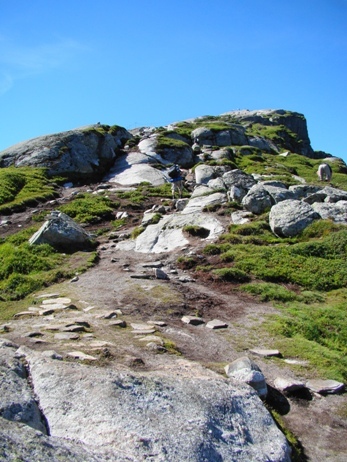 This is a quite long hike with lots of climbing, going up and down a few times before reaching the top of Kjerag. Many of the cliffsides are really steep, but the route has chains to hold on to in the steepest part. The overall distance (including return) is only 11 kilometers, but it easily takes around six hours to complete. 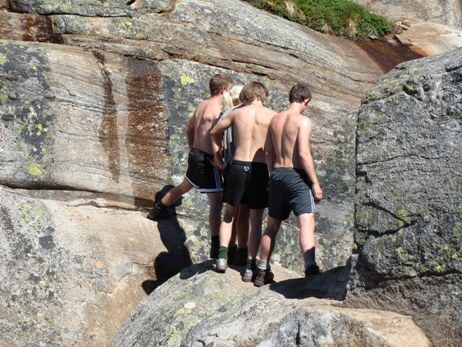 In good weather there are no dangerous parts, except maybe the narrow snowy ledge close to Kjeragbolten, where you still can slip quite safely to the right side suffering only embarassment. The classic step out on Kjeragbolten, the small rock stuck over a fall of 1000 meters to the fjord is of course dangerous too, but that isn’t actually part of the route, and I actually skipped it, knowing that my slight fear of heights might turn my legs to jelly walking the small ledge out to the rock. Ellie was braver and went out for a photoshoot on bolten. 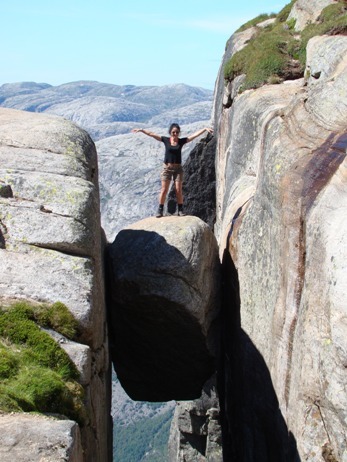 The good thing about Kjerag is that, although it is quite popular, it isn’t overcrowded like Preikestolen. 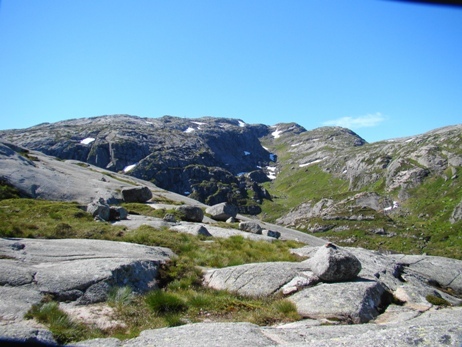 The walk up is much more strenous, and it is so much further from Stavanger that not as many daytrippers bother over there. 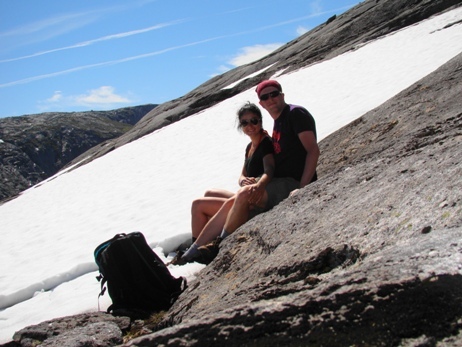 The solitude that you can find on the mountain makes the experience so much more special than the neverending queue up Preikestolen. 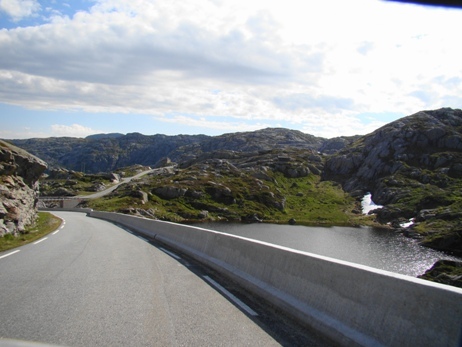 You can get to Øystensstølen by car from Stavanger through Sirdal, or by car ferry to Lysebotn and six kilometers up the road towards Sirdal. 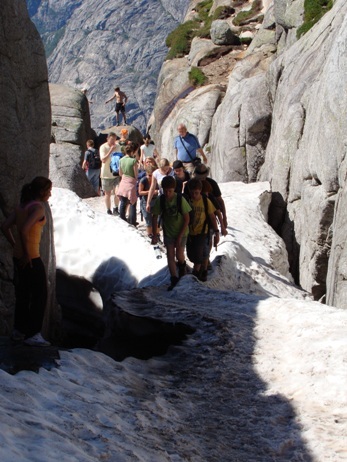 The road is closed in the winter, but doing the hike in icy conditions would anyway be dangerous. Ellie at Kjeragbolten. 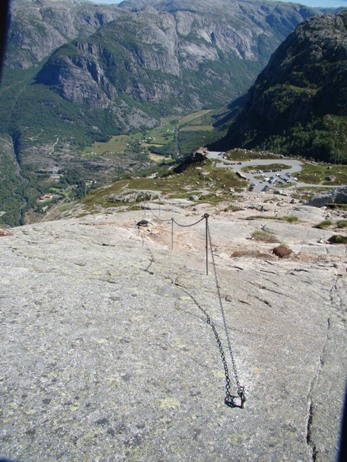 1000 meters fall to the fjord below. Crowded at bolten, five at a time! On the right the narrow ledge you have to pass. Before bolten, you have to pass a slippery and narrow snow crest. The narrowest 5 meter is only about 30 cm in width. 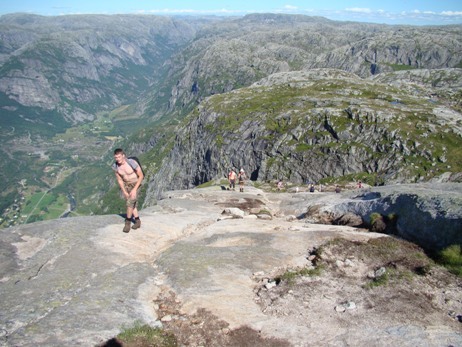 The long steep parts takes your breath, regardless of your physical shape. 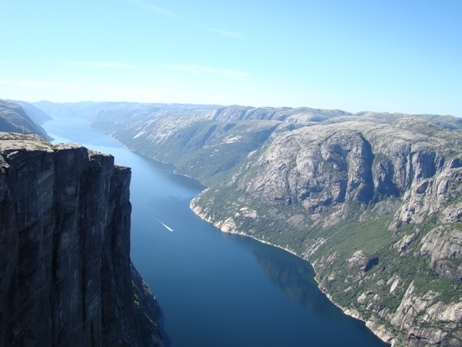 Lysebotn as seen from Kjerag. Anyone for a BASE jump? Amazing photos! 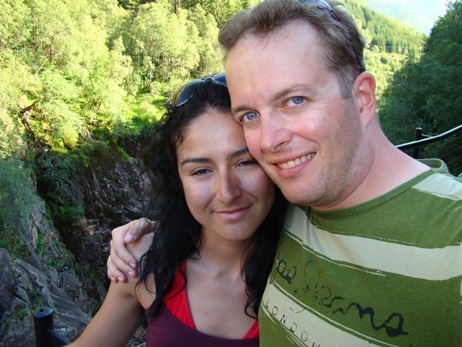 I was just in Norway along the Lysefjord in August. I did the hike up to Preikestolen, but we only saw Kjerag from the water a few days later when we took the 2 1/2 hour cruise. Thanks for sharing your gorgeous photos. Makes me want to go back very soon! 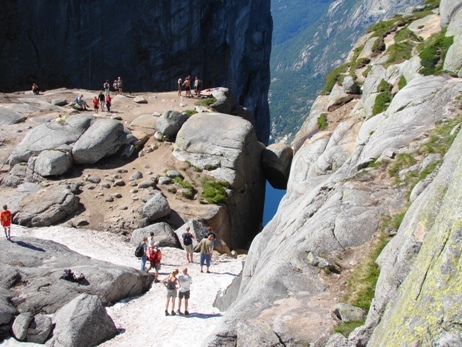 I will have to tackle Kjerag on my next visit – I like the sound of less people. 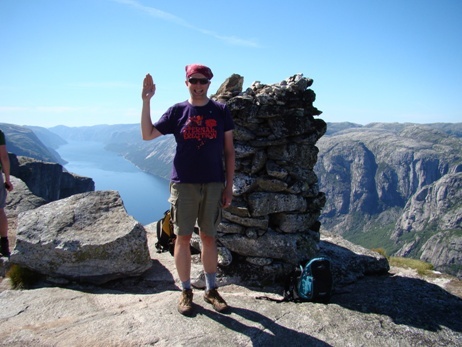 You are right that there were many, many people on the trek up to Preikestolen, but there was still a great reward at the top – the most amazing scenery I have every experienced.